This “Best of Ecuador & Peru” suggested itinerary starts in Quito with a city tour, a visit to the animal & handicraft market in Otavalo, pampering yourself in the hot springs of Papallacta and walk the mighty Cotopaxi Volcano, with its incredibly beautiful crater lake. You will then head back to Quito for your transfer to Lima, Peru. From Lima you get the chance to visit Iquitos for a stay in the Amazon Jungle. Via the Sacred Valley on to the pinnacle moment of your journey, the Incan Empire’s capital city Cusco and the lost city of Machu Picchu. 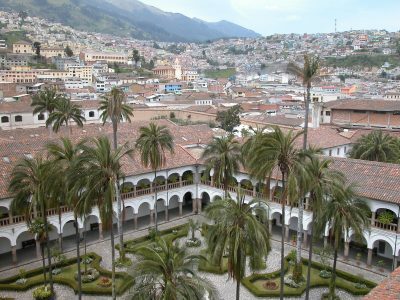 This Ecuador & Peru travel itinerary is jam packed with culture and history! Arrival in Quito. An English speaking guide will pick you up from the airport and transfer you to the hotel. He will be able to assist you in anything you may need. Accommodation in Quito. Breakfast. The tour begins with a great view of the Orellana path and Guapulo Sanctuary (XVII Century). Afterwards, walk in the old city visiting the Independence Square, surrounded by important historical buildings. Visit the Cathedral (XVI Century), the Presidential Palace, El Sagrario Church (XVII Century), and La Compañia de Jesus (XVII Century), one of the most beautiful baroque churches in South America. Not to be missed are the Church of San Francisco and Monastery, built a few months after the arrival of the Spaniards (XVI Century). Later we will drive 15 km north of Quito, towards the Middle of the World where the equatorial line divides the northern and southern hemispheres. We will visit the main monument built in honor of the french scientific expedition that arrived in Ecuador in the XVIII century to determine the correct location of the equator line. Here you will have the opportunity to visit the Ethnographic Museum, located inside the Equator Monument, displaying the main cultures of Ecuador or visit the Inti Ñan Museum, a scientific and cultural museum, located in the exact crossing of the Equator Line. Accommodation in Quito. Drive north towards Imbabura, “the lakes” – Province. We will head to hacienda la Compañia. This hacienda belonged to the Jesuits until Charles III expelled the Jesuits also colonies. Now five generations Jarrin belongs to the family, who has managed to diversify the use of heritage and the business of roses. Therefore, this is a perfect spot to discover and learn from the Ecuadorian roses. Afterwards, visit the famous Otavalo Indian Market. We will head up-north to the millenary Polylepis forest. This unique endemic ecosystem includes the last 12 hectares left in the Andes. The name Polylepis is in fact derived from the Greek words poly (many) plus letis (layers), referring to the shredding, multi-layered bark that is common to all species of the genus. The bark is thick, rough and densely layered for protection against low temperatures. These are also known as “paper trees”. The forest, combined with small waterfalls and clear lakes offers incredible views that create a scenario brought from fairy tales. Accommodation at Polylepis. Enjoy a final walk inside this enchanted forest. We will continue our way to the Province of lakes, in order to visit Huarmi-Maqui, which is a space for the daily work of women in the community that originality demonstrates the preparation and development of handicrafts. 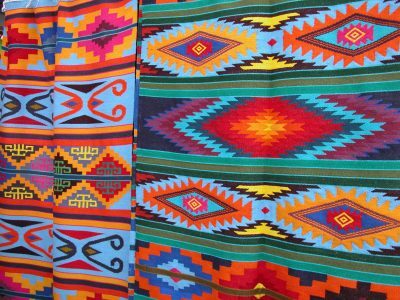 With the demonstration workshops visitors can see as a handmade product works, the typical dress of women Otavaleña, cooking, music and dance, are part of this mosaic of indigenous culture in Otavalo. After visiting, the community and understanding the labors of these women, you will have a typical lunch that will delight yourself over the flavor of the Andes. Overnight at a typical hacienda. We will visit Cuicocha lake, a 3 km wide caldera and crater lake at the foot of Cotacachi Volcano. Its name comes from the Kichwa indigenous language and means “Lago del Cuy” or Guinea Pig Laguna in English. It was given this name due to the guinea pig shape of the largest Island in the middle of the laguna. Then we will go to the village of Cotacachi, specialized in the production of leather goods. The traditional methods of tanning leather, stretching and molding skins, shaping, sewing and painting are passed down from generation to generation and the people living in this region have perfected the art of leather working. Most of their goods are both functional and decorative and the painting and dying is often very beautiful. Finally, we will drive the same route taken by Francisco de Orellana on his way to explore the legendary “El Dorado”, in the Ecuadorian Amazon Region, towards the moors of the Eastern mountain range. During this trip you will appreciate the radical change of scenery due to altitude variation. 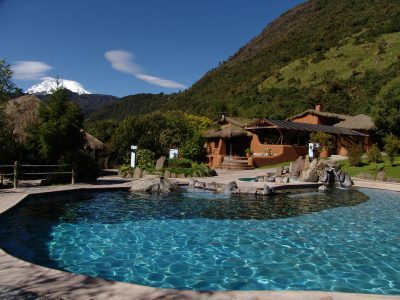 Surrounded by a beautiful landscape at 3,300 m level you will discover Papallacta Hot Springs. Here you will enjoy a relaxing bath in the natural hot waters. Overnight. This morning, you will have the opportunity to enjoy the natural hot springs at the SPA, this is a focused welfare place where you can enjoy the pools of hot springs that are known to be very curative. Additionally you can enjoy different renovator treatments at the Spa. After lunch, we will continue our way to Baños. This small city is located in a valley with waterfalls and natural surroundings. 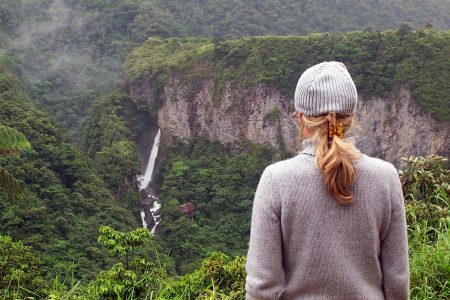 One of the main attractions is the Tungurahua volcano and a variety of adventure sports. Overnight. Visit to the best waterfalls in the area. There are 57 waterfalls in the valley and some are particularly impressive. We will vist “El Manto de la Novia”, or Bride’s Veil, which stretches to more than 260 feet in height. Pailon Del Diablo is the most impressive in the area, which reaches upwards of 328 feet. The ground is actually said to shake where the water makes impact at the bottom of the waterfall. The afternoon is at leisure so you can enjoy other activities that this wonderful place offers. Departure from Baños. This day we will head to Quilotoa Crater Lake, located in the province of Cotopaxi, and is part of the ecological Reserve Ilinizas. The beautiful lake in the crater, with its emerald colored water, will take your breath away. During the trip we will enjoy the picturesque landscape, seeing on the way rural indigenous people in their small agricultural communities. This lagoon is not just any lagoon; it’s a lagoon with a legend. A legend about King of volcanoes Quilotoa who used to live on the surface of the lagoon. He faced many battles with his worst enemy, Toachi, who was living beneath the surface of the lagoon. The temperature is warmer inside than outside, it’s a half-hour hike down from the viewpoint (and 1-2 hour hike back up the 280-meter vertical ascent). Drive along the Pan American Highway, towards one of the world’s highest active volcanoes, Cotopaxi (5,897 masl). Drive on a third class road through a pine forest to Limpiopungo Lake, which is, located 3,800 meters above sea level, along the slopes of the magnificent Cotopaxi volcano. We will enjoy our time at this magnificent place. Transfer to Quito and drop off at the airport for your flight to Lima, Peru (Flight from Quito to Lima is not included in package price). On arrival you stay one night at a Lima airport hotel. Another flight takes you to Iquitos in the Amazon jungle (flight not included in package price). You will be staying 3 days and 2 nights in Ceiba Tops lodge inside the jungle. This afternoon you will be able to join in on a hike through the reserve and in the evening there will be local entertainment. Today’s exploration into the Amazon starts with a morning boat ride spotting pink dolphins and visiting a small village of Yagua Indians. The afternoon is a little more relaxing with a walking excursion to the neighbouring local town of Indiana. This town was originally a Canadian Franciscan Mission. Indiana has now grown into a large river community with its own market, school and hospital. 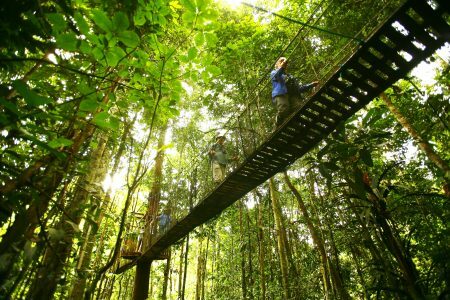 You will have the choice of a morning walking or boating excursion to further enjoy the rain forest and Amazon River. In the afternoon there is a transfer waiting for you for your journey back to Iquitos and to the airport after which you will fly to Cusco for a two nights stay. 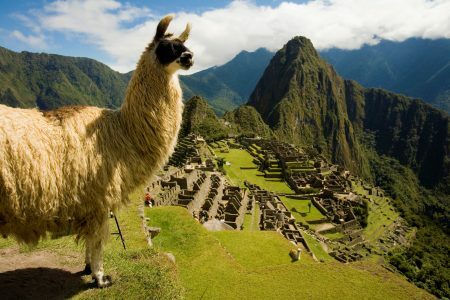 Today you will explore Cusco on a half day sightseeing tour. The tour today takes you to visit the Korikancha (Temple of the Sun), the Cathedral, and then continuing onto the nearby archaeological sites of of Tambomachay (Inca Fountains), Puca-Pukara (the red fortress), Qenko (Sacred site) and finally the famous gigantic Inca fortress of Sacsayhuaman. The many restaurants in your hotel vicinity will let you sample the delicious Peruvian Cuisine. Your full day Machu Picchu tour starts off with a transfer and train to Aquas Calientes for your bus ride up to Machu Picchu, this is an excellent option for those who do not have time to hike the Inca Trail or wish not to. On arrival in Machu Picchu your sightseeing tour of the ruins and entrance fee have been included so you can enjoy Machu Picchu from the moment you arrive at the gates. Soak up the significance of your visit, enjoy the beautiful location and marvel in the intellect and architectural ability of the ancient Incan culture. It is amazing and spectacular just how appropriately located Machu Picchu is in its complimenting surroundings. The Inca Trail Walk can also be arranged for those wishing to experience the beautiful hike to Machu Picchu. After a relaxing morning in Machu Picchu we will take you back by train to your Cusco hotel. On arrival into Cusco you have the remainder of the day to relax, dine, wander through the colourful markets or get last minute souvenirs to remember your time here. After breakfast your Best of Ecuador and Peru tour concludes with a departure transfer to Cusco Airport.